Lot Detail - Jarri Kurri's 1982-83 Edmonton Oilers 100th Point of Season Milestone Goal Puck with LOA - Goal Scored by Wayne Gretzky! 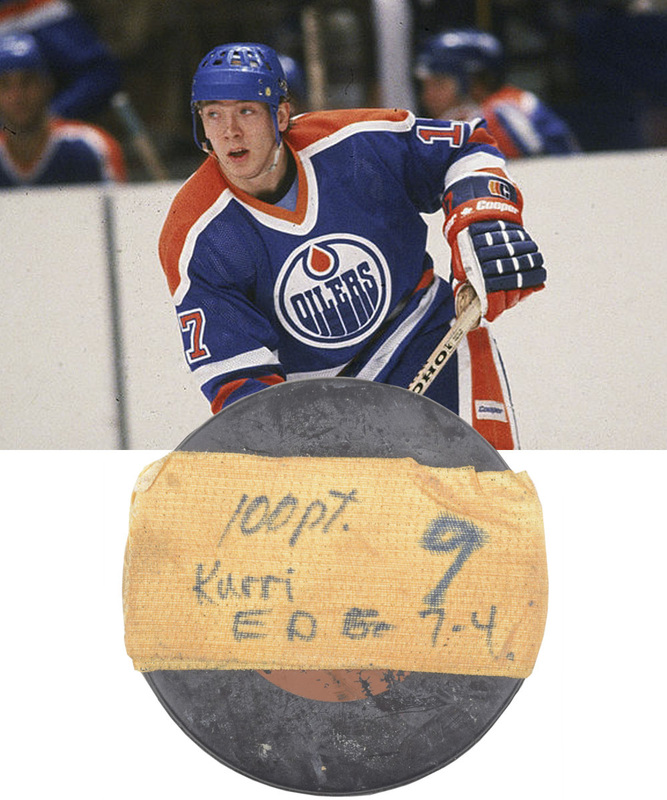 Jarri Kurri's 1982-83 Edmonton Oilers 100th Point of Season Milestone Goal Puck with LOA - Goal Scored by Wayne Gretzky! Finishing his career just two points shy of 1400, Jari Kurri would net over 600 goals, with his 233 career playoff points especially impressive. His 100th point of the 1982-83 season came on March 29th as he picked up two goals and two assists in a 7-4 decision over the Vancouver Canucks. 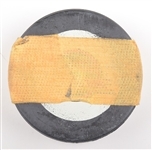 Assisting on a goal scored by Wayne Gretzky at the 3:18 mark of the third period, the official Canucks game puck from this milestone assist and Gretzky goal has been wrapped with a strip of aged cloth tape and marked "100 pt, Kurri, Edm 7-4". Originating from the archive of the Edmonton Oilers, this highly desirable puck will be accompanied by an LOA on Oilers letterhead, signed by then-General Manager Kevin Lowe.